Are You Ready To Quit Chewing Tobacco? Available free of charge to dentists, health clinics and corporate health programs for employees. The dangers of chewing tobacco have not received the same publicity that smoking has. A chemical time-bomb is ticking in the mouths of millions of Americans. About half of the kids who use chewing tobacco have precancerous lesions in their mouth and don’t recognize it. And, the chances of chewing tobacco user getting lip cancer is 400% greater than non-tobacco users. Cost: Free for one. $4 for 20. Delivered to U.S addresses only. Click on image to download printable PDF. A small, two page brochure describing the act of chewing and dipping. Also has short description of the dangers of smokeless tobacco use. Good elementary information. Quick read. Printed by ACS in 1981. 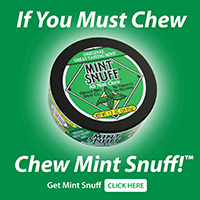 Information on what Mint Snuff All Mint Chew and Pouches are and how they are used. Excellent description of why people chew, dangers of chewing and cessation tips. Order form is enclosed. Small brochure suitable for grades 6-11 that gives brief description of the dangers of smokeless tobacco including early signs of leucoplakia, the cost of SLT use and a brief description of nicotine addiction. Also includes a short paragraph on SLT effects to the heart and oral problems. Opens up into a nice 8×14 poster for bulletin boards. Small brochure suitable for grades 6-12. Very good treatment of frequently asked questions regarding smokeless tobacco. Photo inside of boy taking a dip and folds out to show result of dipping to teeth. Photos: Good graphics. Photos of Sean Marsee before and after. An excellent brochure suitable for ages 12 through adult. Also good for professionals to learn more about the hard facts of smokeless tobacco use. It describes the problem of smokeless tobacco use and relevant facts about effects on the body as well as the role of the health professional in helping the patient. Photos: Three excellent color photos of oral carcinoma, recession, tooth loss and mucosal changes. To obtain: Contact your state American Cancer Society office or call 1-800-ACS-2345 (1-800-227-2345).